First. Is it not a notorious fact that you are the attorney of every crook, gambler, Mary Magdalene and the whisky ring, provided of course any one of this clan has the price to pay you? Second. Have you the audacity to ask the people of this city to believe that your intentions were straight to prosecute Leo M. Frank for the paltry sum of $500, and then donate that fee to the Burns Agency to secure the evidence that the chief of detectives had already procured? Is it not a notorious fact that you received a hundred thousand dollars in the famous dispensary cases of South Carolina, a state by the way whenever you start to New York you always buy a ticket by a route that does not touch its border? Third. Is it not a notorious fact that you have been known far and wide, not only as an attorney but as a astute politician, lobbyist, and pardon broker, and did you not receive one hundred thousand dollars from Charles W. Morse, or his wife, to deliver the goods? Fourth—It does not make any difference to me, personally, what kind of an attack you may see fit to make upon me with your vile pen, and I note that you state that you can get one thousand men to swear that they would not believe me on oath. I desire to ask you that before you can impeach my onath [sic] does not the law require you to bring forward my neighbors and my acquaintances who know me and who will state that upon their knowledge of me they would not believe me on oath? Or is it your purpose to scour among your clients, principally those who belong to the red light district and the whiskey ring and are ever ready to do your bidding, even the swearing a man’s life or character away, one of whom called upon me this afternoon by the name of McNeil, who professed to live in Nashville, Tenn., some fifteen years ago, and wanted to rake up an old boyhood acquaintance, as his breath smelled like a distillery on legs, so much so that my wife had to leave the room, and knowing that you are in the habit of digging up such people as this when you have got any dirty work to carry out. I was extremely reticent with him, and fortunately I had two gentlemen in the hotel office, of unimpeachable character, who happened to be sitting close enough to me to know that about all Mr. McNeil got out of me was yea and nay. Fifth—Is it not a fact that you are sore because this city happens to have at the present time a high-toned, honorable Christian gentleman, who is a man of God and tries to practice his belief in the Christian religion, and would not prostitute his oath of office as chief of police by catering to you and your cohorts? And if he had wouldn’t he have been the grandest chief in your poor eyes that are glued by filthy lucre that ever ruled Atlanta’s police department, for there has never been any one who knows you that will doubt the assertion that you have been a worshipper of gold instead of God, and had no conscientious scruples as to how you obtained it. Sixth—I note that you are going to attack me with an affidavit from one, W. A. Milner, attorney-at-law, of Cartersville, Ga., in which he charges me with the crime of having professed religion in Cartersville and acknowledging that I was an ex-convict. As to this charge, which was made in the Constitution of Saturday, I refer to a telegram printed in this issue of The Journal, exclusively. Is it a crime to profess religion? It was not considered so in the home that I was raised in under the influence of a sweet Christian mother, which no doubt you yourself had the same kind of a mother, but I fear that you and I both have strayed far away from the early influence of our sweet Christian homes. In fact I am free to confess that I have done so since the time that I helped you wash your dirty, filthy, political linen in South Carolina. And I fear that the gentleman from Cartersville would not know religion if he were to me[e]t it upon the public highway. For religion believes in helping the fallen to rise and not pushing them down. I cannot control things that happened in Cartersville among some people that I did not know forty years ago, but have since beocme [sic] connected with, and I have to pay the price of a poor miserable amlice carried in the fertile brain of Colonel Milner, who belongs to the political clan that you are aligned with. 7. 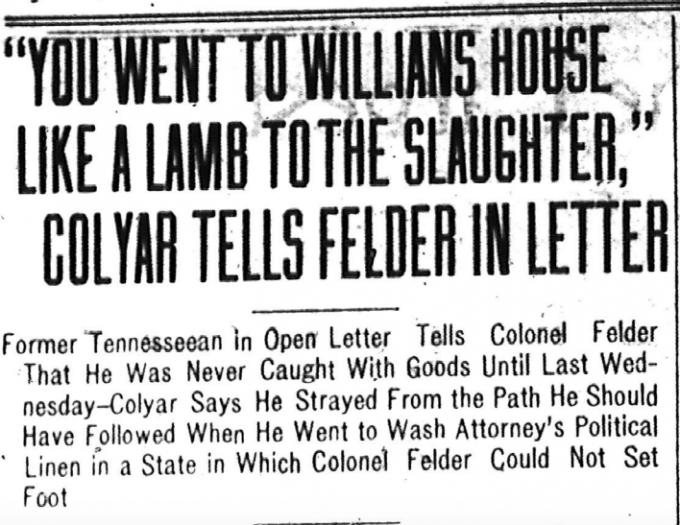 I note that you are attacking me in an affidavit purporting to have been signed by one W. D. Ray, of Nashville, Tenn., who claims to be a neighbor of mine. For your information as well as Mr. Ray, I wish to state that I do not know him, and that I have not been a resident of Nashville, Tenn., since April, 1899, and I never knew any Ray in Nashville, Tenn., and I would appreciate the fact if you would tell me who he is. I also note that you are attacking me with one Atchison of Nashville, who says that I am a moral degeneratel [sic] and pervert. I presume that Mr. Atchison has qualified that he is an expert witness, and has not allowed you to frame up the affidavit for him to sign, as everyone who knows you, know that you are an artist in such matters. I note that you have brought into your affidavit category your royal flunky, C. W. Tobie, who took occasion to attack me in a sheet published in this city Saturday afternoon. But the ear marks of his article show too plainly that the author of it was Tobie’s master, Felder. What does Tobie know about me? And is it not a fact that you and Tobie are sore because your scheme has been exposed to graft a large amount of money out of the citizens of Atlanta. And don’t you know it to be a fact that Tobie is ready to sign any affidavit pertaining to any subject that you might suggest? And don’t’ you also know that when you and Tobie attempt to slur the Atlanta police department and the Pinkerton Detective agency and charge me with being a tool in their hands to break you and the Burns’ agency down, that it is only a makeshift to divert the public mind from the real issue that you, a member of the Atlanta bar and a former member of the legislation from Fulton county, and a poser as a statesman, and a great lawyer, would forget your high profession and stoop so low as to attempt to bribe a poor, honest young man, struggling to get a foothold in life, to rob his chief and superior officer of certain valuable papers in the Phagan case for $1,000? Before you call me a moral degenerate and pervert think of the enormity of your attempted crime in trying to brand this young man as a thief the balance of his life. Ninth—Now, colonel, I did not intend to write such a lengthy letter when I started, but I desire to call your attention to another matter. You have stated in one of your many newspaper interviews, where you had a chance to get free advertising, which is part of your egotistical nature to feast and fatten upon, that you refused to give an introduction to one E. O. Miles. To refresh your memory, I refer you to that card of introduction with your signature attached to it, reproduced in this issue of The Journal, and I hope that you have not become such a moral pervert since we parted company as to denounce the signature a forgery. But, yet, if you found yourself hemmed in, and saw no other escape, I dare say that you would not hesitate to denounce it as such. In conclusion, permit me to say frankly and candidly that I have strayed away from the path I should have followed in life in some instances, but the difference between you and I, Colonel, is simply this: I have been caught in times gone by, and you have never been caught with the goods on you until you walked into room No. 31 in the Williams [h]ouse No. 2, like a lamb for the slaughter, and allowed yourself to be taken by the dictograph, and it is natural you are sore. I do not blame you. Any farmer will tell you that when a pig gets caught in a sty he will squeal. I note that the people of Bellwood as well as the Colemans have repudiated you. It is sad to think when a gentleman of your ability and standing at the bar; who controlled governors, and judges, solicitor generals, and last but not least great mayors, and started out to gain a great reputation in the Phagan case, alas! has come to a sorrowful end because he could not induce a poor, young struggling stenographer to commit the crime of larceny for the paltry sum of $1,000. [G]ood-bye, Colonel, I am going [to] try to live honest in the future, and I know that I can do so if I will only be guarded in the associations that I form than I have been in the past. Atlanta, Ga., May 24, 1913. P.S. I note I was arrested Saturday afternoon on a frame up of four years standing in my native state, brought against me by a member of the Red Light District, among whom you have so many clients.